Garden & Landscape Directory | Hints & Tips | Should I add a gazebo to my garden? 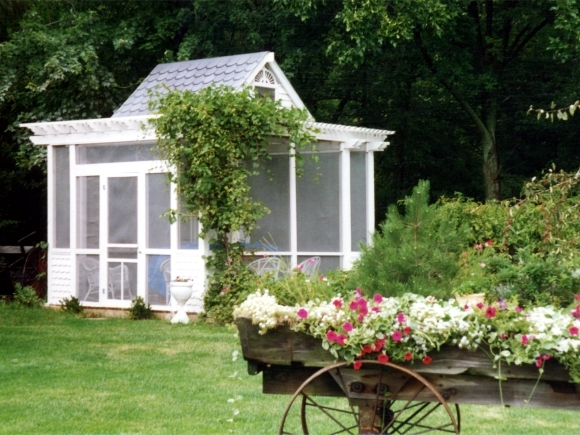 If you open any garden or landscaping magazine, you are sure to find gazebos have increased in popularity for almost every type of garden. Because gazebos come in a range of shapes and sizes and can be made from a range of materials, they not only enhance the functionality of a garden but they also improve the beauty of the space. As there are so many different options available for gazebos and the outdoor furniture to include within them, you should be able to find something to suit your garden as well as your budget. Adding a gazebo to your garden will allow you to enjoy the outdoors during times of the year when you may not choose to be outside. Screened gazebos provide for protection from annoying mosquitoes, bees, wasps and flies, while still letting the sounds and smells of nature fill the space. The roof allows you and your family to enjoy an outdoor living space whether the sun is shining or not. The shape of gazebos protect from the hot sun's rays and allow cool breezes to make being outside during the summer months that much more comfortable. In the spring and autumn, you can still use your outdoor furniture as the gazebo protects you and your furniture from the rain. Adding window panes makes for a year round structure. When choosing a style of gazebo, your best bet is to pick one that suits other permanent features, such as your home and garage. While many people want their gazebo to be a showpiece of their garden, it should still blend in and enhance your home and garden. The last thing you want is to add gazebos and outdoor furniture that are in stark contrast to the rest of the area. No one wants an eyesore in their garden. The placement of your gazebo should also be seriously considered before deciding on the one you want and beginning the building process. Many choose a corner of their garden to maximise the ground space still available. For those with smaller gardens, or that want their gazebo to be a showpiece, choosing a larger gazebo and placing it in the centre of the garden may be the final decision. Lastly, other structures in your garden, such as ponds and pools, decks and patios, may dictate where you place your gazebo. How you want to use your gazebo should also be a consideration when looking for outdoor furniture and accessories to include in your gazebo. For those looking for a romantic spot in their garden, creating an outdoor lounge may be what you want to do. Comfortable chairs, loveseats and chaise longues coupled with low tables that may include a fire pit can create a more intimate atmosphere. For those looking for additional dining space or a gathering area for friends and family, more functional dining table and chairs or outdoor conservatory furniture may be what you want to add. As within your home, choosing the right style and design of outdoor furniture can continue the look of your home outside as well as enhancing your outdoor living space within your garden.